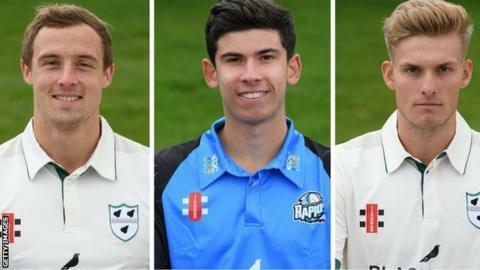 Worcestershire have signed three of their pace bowlers, Charlie Morris, Pat Brown and Adam Finch, to new contracts. Morris, 26, and Finch, 18, have new deals to the end of the 2020 season after adding an additional 12 months. Brown, 20, who made such an impact in Worcestershire's T20 Blast triumph last summer, has also added another year to his deal, tying him to the end of 2021. "We have strong ambitions as to where we want to go in the years to come," said chief executive Matt Rawnsley. "We have the bulk of our squad signed up for at least the next two years or more. For so many players to be signed up gives us a good platform." Morris, who first joined the staff at New Road in 2013, has overcome a frustrating three years of bowling action problems to return to the Worcestershire first team this season. He was rewarded for all his efforts with a career-best 7-45 in their opening County Championship win over Leicestershire at Grace Road. Brown was the country's leading wicket-taker in the 2018 T20 with 31, but has so far made just five first-class appearances. Finch has yet to make his Worcestershire first-team debut, but has so far taken 14 wickets in four Under-19 Tests for England.